ESP LTD TL-6N Review – A Classical Wildcard! 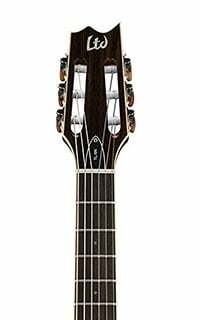 At GuitarFella, we love a wildcard and, to be honest, there are few wilder in the world of classical guitar than this head-turning TL-6N Thinline electro-acoustic from ESP’s LTD. The Japanese brand are renowned for their fast and furious electric guitars – less so for their classical models. But, sitting at the lower end of the sub-$1000 classical guitar market, it’s worth looking at in more depth. Where do we start… it’s not your standard classical guitar, that’s for sure! With a 25” scale length and thin body depth, the TL-6N feels very much like an electric guitar to hold. In fact, it’s cut from the same cloth as ESP’s EC range of electric guitars (very Les Paul-esque, with a deep cutaway), and features a semi-hollow body made from mahogany with a spruce top. Being made this way, there’s no traditional soundhole – instead you get a single thorn-shaped soundhole on the lower bout. Further electric guitar similarities include the fact that the neck joins the body at the 16th fret, with a total of 22 jumbo frets, all easy to get to. This mahogany neck is super slick to play, with the reduced nut width of 1.89”, a thin U shape, and a nice rosewood fretboard. Traditionalist will hate the body, neck and audacity that it classes itself as a classical guitar. The rest of us will appreciate its accessibility, comfort and attitude. The TL-6N is loaded with some pretty good hardware. Starting with the electronics, it’s voiced by an undersaddle B-Band transducer, which is tended to by a B-Band T-7 preamp. This system is pretty versatile, offering volume control and 3-band EQ, as well as a built-in digital tuner. Sticking with tradition, the guitar sports a slotted headstock with open-gear tuners and attractive buttons, while the nut and saddle are both made from GraphTech’s consistent NuBone-XB. This guitar doesn’t come with a case, which is a shame as it’s quite a long guitar, so cramming it into any of your existing cases may be a struggle. (Note: ESP do sell a case specifically for this model, although this is a separate purchase). The TL-6N certainly sounds like a traditional nylon-stringed acoustic, although acoustically it’s a bit quiet. This was to be expected, due to the unorthodox body for a nylon-stringed guitar. It still produces more than enough sound for practice, but it’s only when plugged in does this classical model really start singing and is apt for many styles of music. The B-Band electronics produce a full, rich sound that’s easily shaped, while the feedback reduction through the phase switch is a handy addition for stage performances. A wildcard, yes, but a worthwhile inclusion as it will appeal to many guitarists – electric players who want to cross into the world of fingerstyle; stage performers who want a maneuverable, plug-and-play classical; or recording artists who want the smooth sound of nylon on their next track. The playability is fantastic, it looks great and – when plugged in – is very toneful. For the price, it’s a pretty good purchase. For more info about the ESP LTD TL-6N, click here. For more classical guitar under $1000 you might like, click here.